My son is fascinated with owls! I wanted to make him a footprint owl, but now I’m wondering if a handprint owl would have looked better…hmmm. To make this owl, place a brown footprint on a piece of paper and then paint wings on each side. Paint on the facial features and feet when it dries. 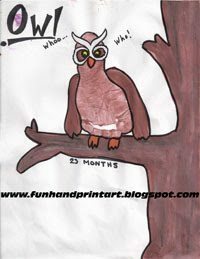 You could also use googly eyes or even make thumbprint eyes.I thought it would be cute to have the owl sitting on a tree. Check out the Owl Themed Crafts my little artist made!